You may have heard of “looping” pins before, but it used to be that you could only do that on BoardBooster (RIP BoardBooster). When you “loop” pins, old pins get repinned so they get a chance to be seen again. And now there’s good news for Tailwind users. Tailwind’s SmartLoop feature is out, and it works great! 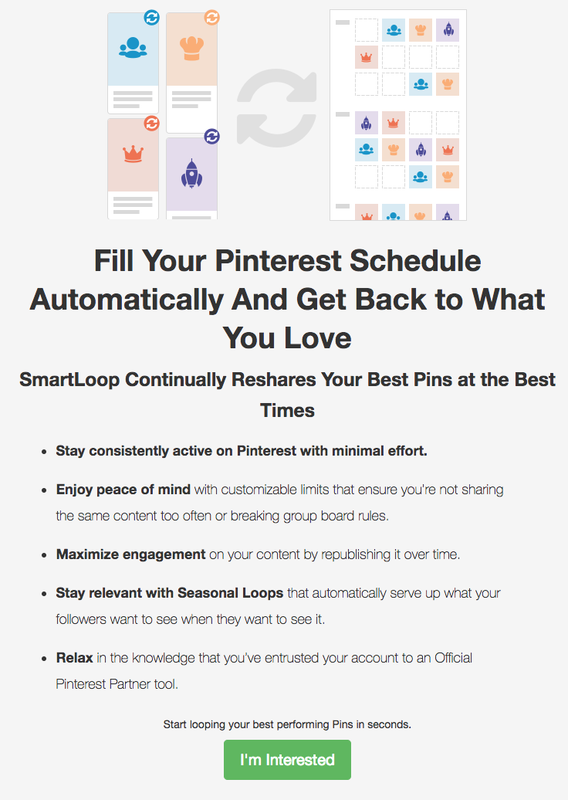 Here’s how to use Tailwind’s SmartLoop feature to grow your Pinterest account. For even more Pinterest goodness, make sure to sign up for my Pinterest workshop! *This article contains affiliate links. This means that if you click a link and make a purchase, I may receive a small commission. There is no extra cost to you for this. I appreciate your support! Looping means that old pins on a particular board get repinned so that they get seen again on the feed. 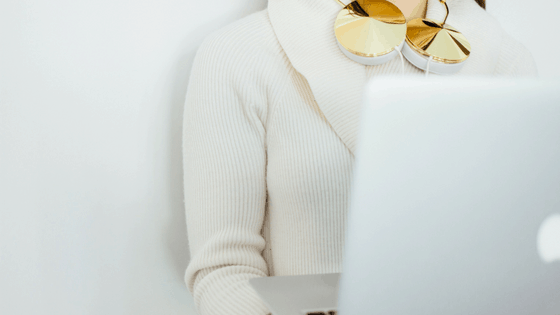 It’s a great way to get your content seen without having to do anything at all. Once you set it up, it’s all automated. BoardBooster used to offer this feature, and now Tailwind does too! First, navigate to the SmartLoop area, which is located under the Publisher icon. You'll have the option to select either an evergreen loop (meaning that it runs all the time) or a seasonal loop (meaning that it only runs at particular times of the year). You might want to do a seasonal loop for things like holiday boards. That way you’re not pinning Christmas decorations in July. Otherwise, an evergreen loop is probably what you want. 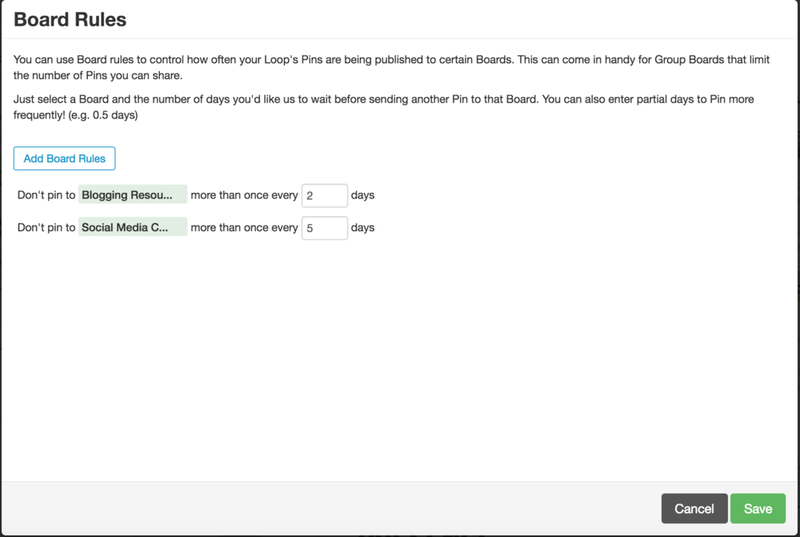 Next you’ll have the option to name your loop and select which board, or boards, you want the pins to post to. You can have them go all to one board, or to multiple boards. Once you’ve done that, you can add pins to your loop. Select which board you want your pins to come from, and if you want the whole board, or only pins from your own domain. Or you can even hand-select particular pins to be looped. Then add the pins to the loop, and you’re good to go! Your pins will automatically be added to your Smart Schedule. You can also set up “board rules” that tell Tailwind how often they should pin to a particular board. This is useful for group boards that have rules about how often you can post. 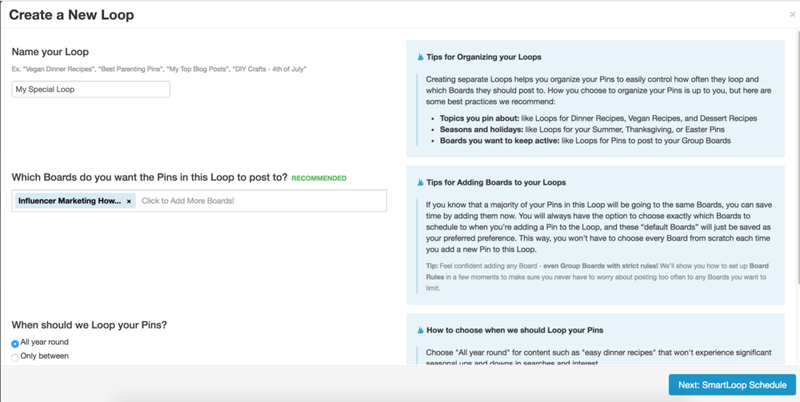 SmartLoop also works great for scheduling to group boards. 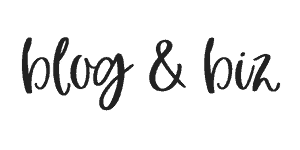 You can set all of your group boards as the boards where the content will be pinned to, and then set your blog board as the board where the content comes from. It’s like the “Campaigns” feature from BoardBooster. How do you get SmartLoop? If you sign up for Tailwind through this link, you'll see an option for SmartLoop on your account. The feature is currently still in Beta, so you'll have the chance to check out what it's all about, and if you want, sign up! 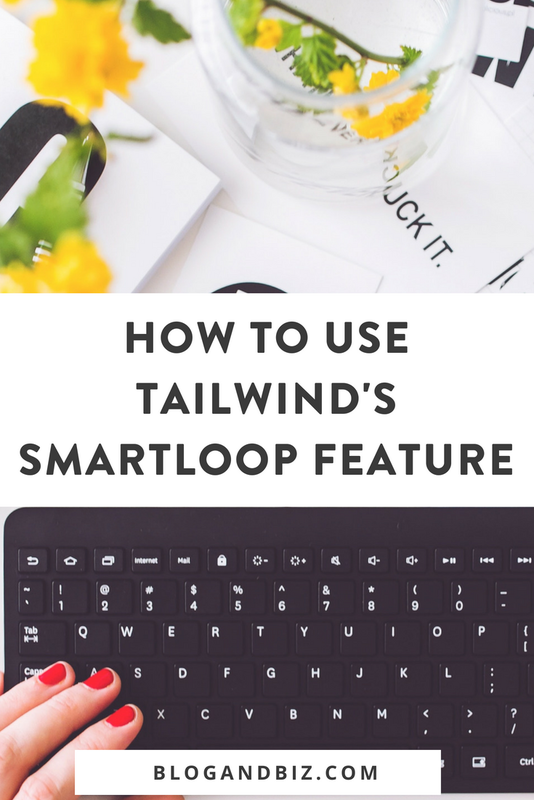 SmartLoop is a great new feature from Tailwind. I’m using it for all my looping, and my group board pinning now. Combined with the pins that I pin from Tailwind Tribes (another great feature), this accounts for almost all of my pinning. I highly recommend checking out SmartLoop (or all of Tailwind, if you haven’t yet). Have you tried it yet?? Let me know in the comments! 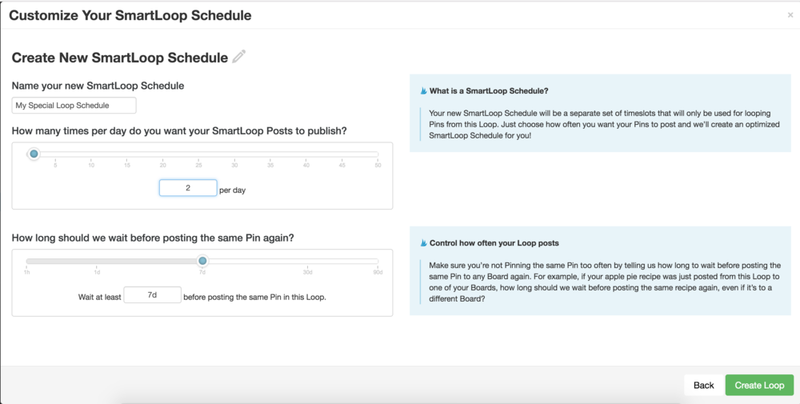 This is a great post on how to use SmartLoop, but my only issue is that this feature is not yet available to everyone. At least, in my two Tailwind accounts all it says is what SmartLoop will do and then I can take a short survey. Any ideas when this feature will be available to everyone? Thanks for this in depth guide, very helpful! I got let into the SmartLoop beta recently!